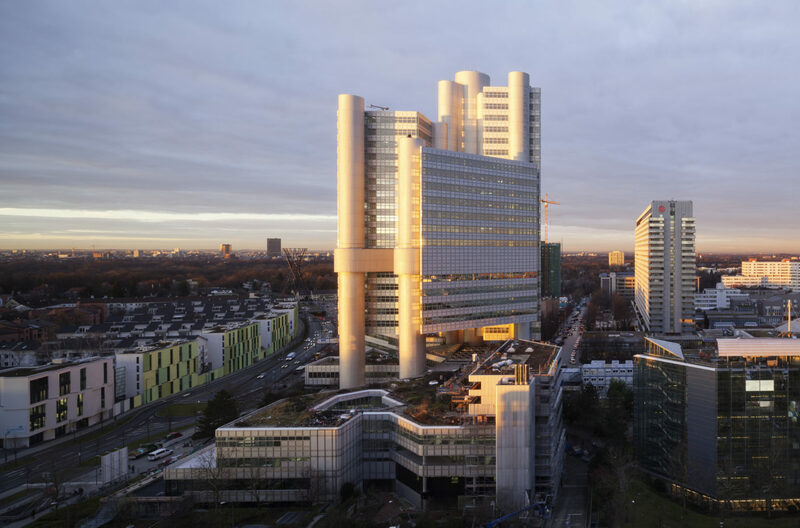 The renovation of the HVB Tower in Munich has given one of the symbols of the city a new face, with a gleaming new futuristic façade and a contemporary work landscape inside. Behind the English Garden in the Arabella Park stands one of Munich’s most striking structures: the HVB Tower. Munich-based architects Walther and Bea Betz created the building between 1975 and 1981 as the headquarters for what was then Bayerische Hypotheken- und Wechsel-Bank AG. With its external supply towers and its aluminum façade, the HVB Tower is a direct forerunner of major high-rise buildings such as the Lloyd’s Building in London designed by Richard Rogers or the Hongkong and Shanghai Bank (HSBC) by Norman Foster in Hong Kong. All these buildings put the constructive elements of the architecture on the outside and turn them into an element of the design. The high-tech forms of the ventilation shafts, elevators and supporting structures are presented visibly and elevated to the level of ornamentation. With 31 stories and a building height of almost 114 meters, the HVB Tower is one of the city’s five tallest buildings. 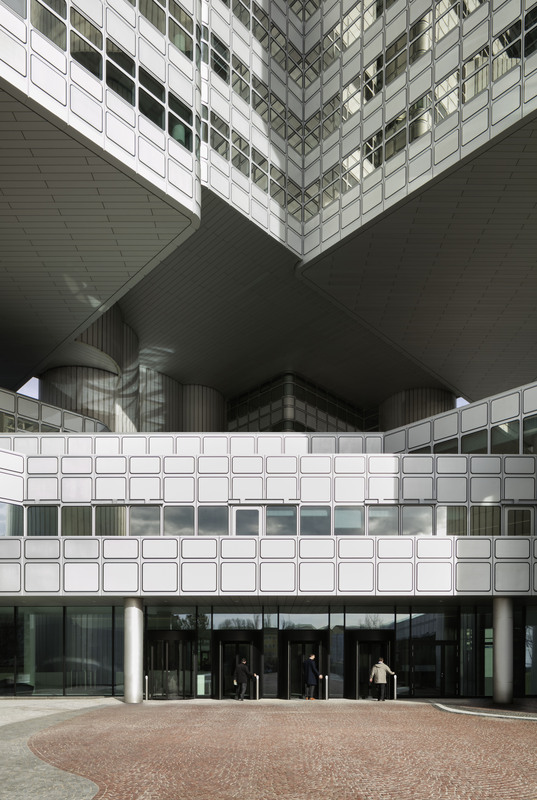 Today it has the look of yesteryear’s vision of the future: Like a space ship, the characteristic façade of matt aluminum and mirrored panes of glass shimmers in a silvery-yellow or orangey-pink depending on the time of day. 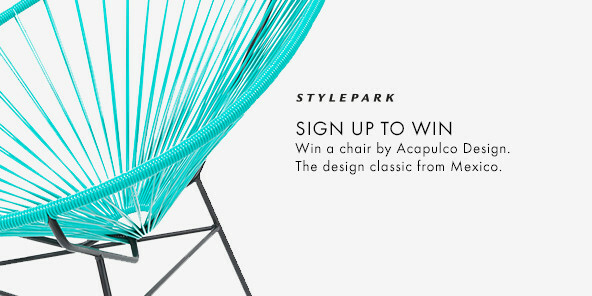 On a broad plinth structure, four round mega-supports soar upwards, gripping the “floating” core of the high-rise, with its floorplan in the shape of three isosceles triangles, within enormous clamps. The unusual cylindrical shape of the structural elements, which accommodate the supply cables and access facilities, give the tower its unique form. This means broad and flexible floorplans could be created for the varying layout of the office space and work areas. 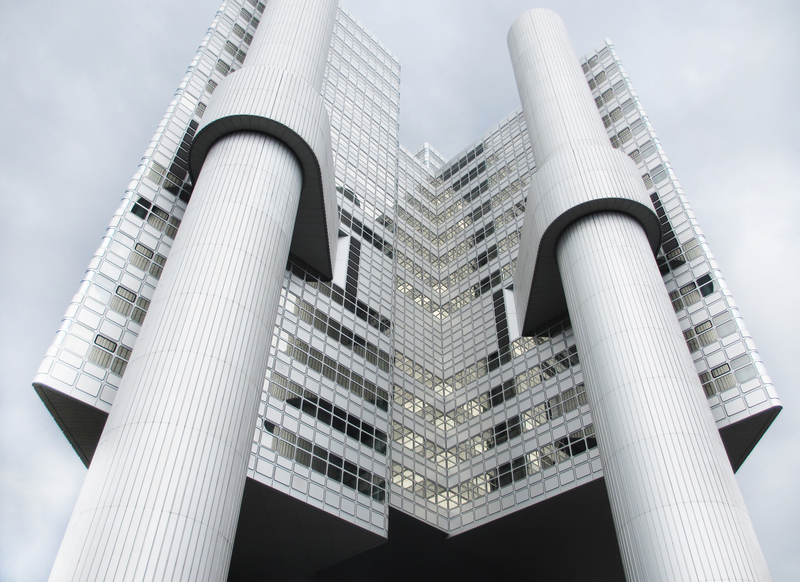 Since 2015 the building has been the headquarters of HypoVereinsbank, which came about through the merger of Bayerische Hypotheken- und Wechsel-Bank and Bayerische Vereinsbank. 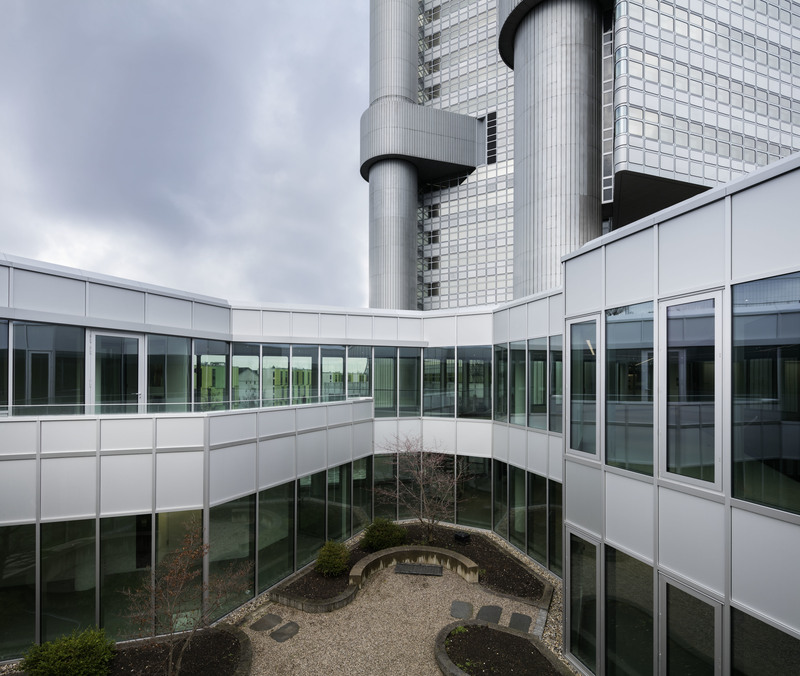 Elaborate renovation projects carried out by Munich-based architects Henn in 2007 and 2015 have made this listed building into a high-tech, eco-efficient “green building” with LEED certification. Whilst from the outside the building’s original appearance appears to have been preserved, the inside has been completely gutted and rebuilt from scratch. 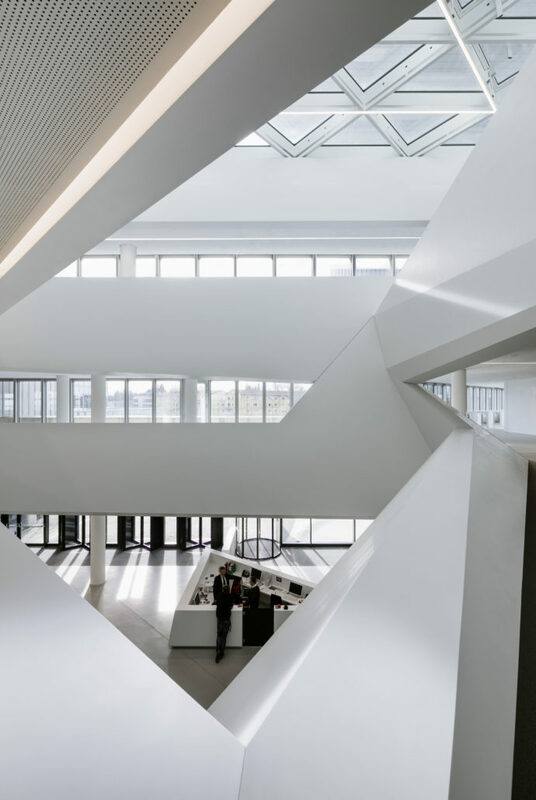 You now enter the building through a dazzling white three-story atrium, which is in stark contrast to the retro-futuristic design language of the exterior. The romantic visions of the future and work ethics of yesteryear appear to have given way to an atmosphere created with efficiency in mind. 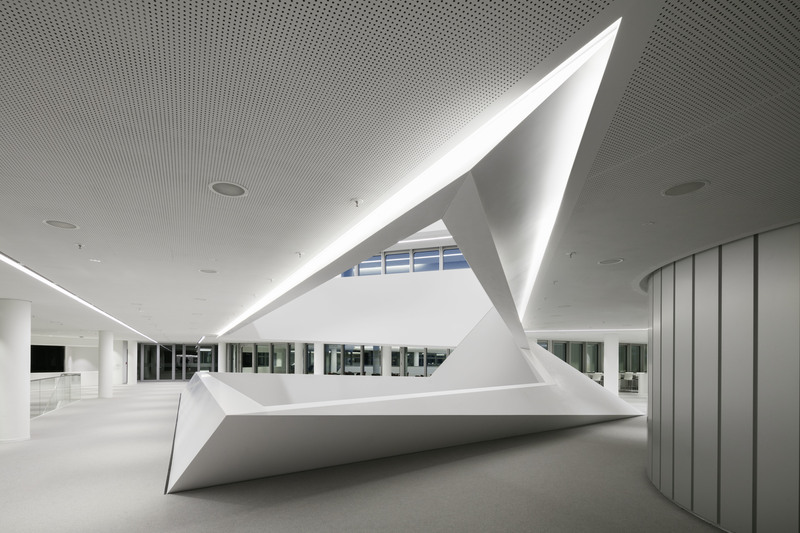 The entrance to the working world of HypoVereinsbank has been designed as very open and spacious – there is a dynamism to the stairs that rise steeply around the open atrium, meet sharply in the corners and flow into long corridors leading to the work areas. The lounge area on the first floor is similarly open in its design and is supposed to offer a variety of possibilities for meetings and discussions. In the leisure areas too, a great deal of effort has clearly gone into creating an ideal atmosphere for social encounters and an informal environment in which quick meetings can be held. Anyone feeling hungry can help themselves to one of the small dishes already apportioned out and waiting to be grabbed from display cabinets like capsules in a space shuttle. Nevertheless the spacious impression of the public areas is in fundamental contrast to the strictly regimented workflows. The new concept of “smart working” demands that employees be flexible in their way of working. The term encompasses a performance-oriented spatial and organizational concept for the structuring of work processes and increasing effectiveness in the workplace. 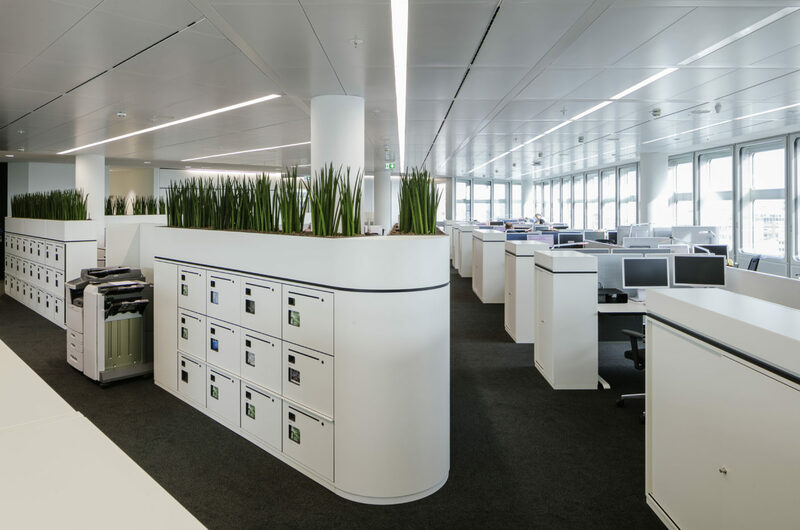 Here the HypoVereinsbank is entirely following the current trend of “dynamic office landscapes” without fixed workspaces. As part of the day-to-day work process employees move around the different areas using a trolley case. All their materials are stored in the case or digitally. 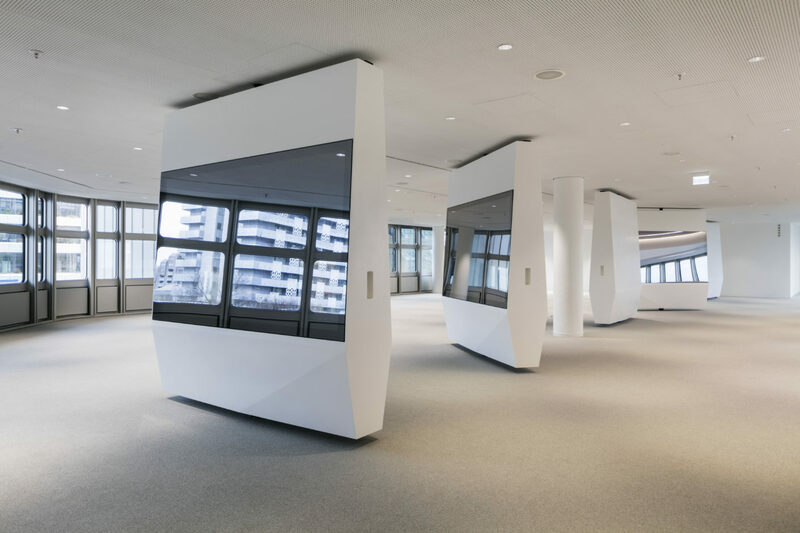 This so-called “clean desk” strategy is supposed to make the coordinated work process even more precise, flexible and rapid – fixed office workspaces are considered to be factors that are “a barrier to transformation”. Depending on the area of activity, the employees move between the work islands and occupy workstations only temporarily. 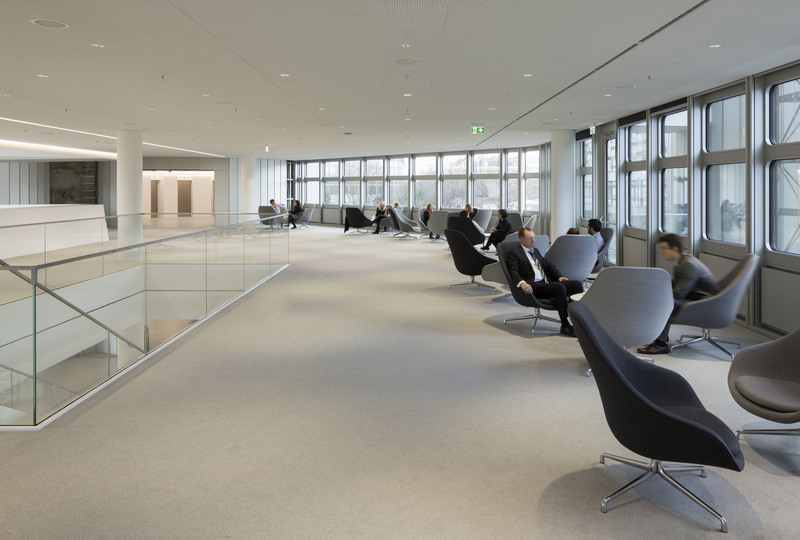 They have a choice of the “Focus Area”, the “Co-working Area” or the “Business Lounge” on the first floor. The contemporary work environment is undoubtedly smoothly designed and creates the impression of being tailored to the work processes. At the same time, the open office landscapes are suggestive of employees’ autonomy and flexibility. In reality however, the new office concept appears to take into account primarily economic factors, which are aimed at improving the speed of adaptation and implementation in work processes. Whilst from the outside the HVB Tower embodies a charming infatuation with everything high-tech from a bygone vision of the future, the interior is an almost sterile work atmosphere that aims to correspond to the highly efficient and engineered organization and communication structure of the contemporary working world.